Jobs: Hussein is a student and works at his family’s furniture store; Mariam is a stay-at-home mother. Voted for: Hussein voted for Jill Stein; Mariam voted only in local races and left the presidential race blank. 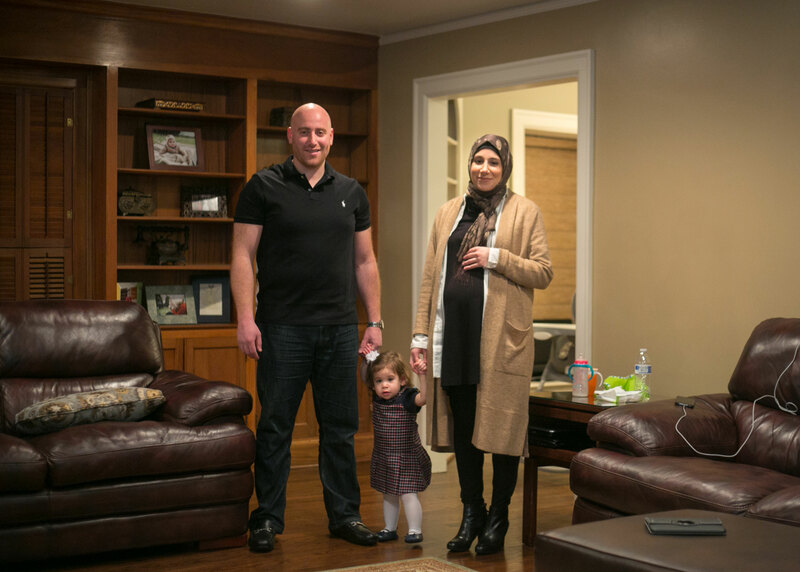 DEARBORN — It’s hard to believe anyone leaves Hussein and Mariam Charara’s house empty-handed. Here, take these cookies – along with coffee, water, candy, with a side table produced out of nowhere to put everything on. Hospitality is as deeply ingrained in the Chararas as free-floating nervousness is in Dearborn. Hospitality is a Middle Eastern tradition, where the family of both hail, although Hussein and Mariam were born in the U.S. He loves the Green Bay Packers, she the Detroit Red Wings. They both love Madina, their 1-year-old daughter. And they eagerly await the birth of a son, expected in April. He’ll be named Imad, in the Lebanese tradition, after his grandfather. The Chararas are Muslim. They feel safe in Dearborn, home to one of the largest Muslim populations in the country, with a mayor named O’Reilly and the police chief, Haddad. Hijab-wearing women like Mariam are as commonplace as Ford vehicles. Mariam was alone on election night, Tuesday being Hussein’s night to play cards with his buddies. She texted him throughout the evening, and he kept telling her don’t be afraid, he’s not going to win. A Muslim registry, suggested by Donald Trump during the campaign, wouldn’t be happening, he assured her. She went to bed around midnight, he sometime after. She awoke at 2:30 a.m., checked her phone and it seemed like her heart stopped. Hussein stirred next to her. They lay in the dark, stunned. Not long after the election, Mariam wanted to go shopping at the outlet mall in Howell. “Not yet,” Hussein advised, and she stayed home.